Just in case you think I've skipped town, I thought I'd share what's been on my paint table for the last two weeks. 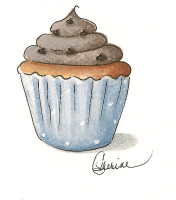 I've decided that I need to get back to painting some folk art scenes instead of cupcakes every week. It's been fun, but very slow going. The scene I'm working on is the Village Inn from Strasburg, PA. I'm painting it as an autumn scene with lots of brightly colored leaves and pumpkins. I visited Strasburg while teaching several years ago at Steph's Folk Art and fell in love with the area. My hope and goal is to finish this painting this week. I got a surprise in the mail this week from Paraclete Press. What a sweet little book about Gratitude. 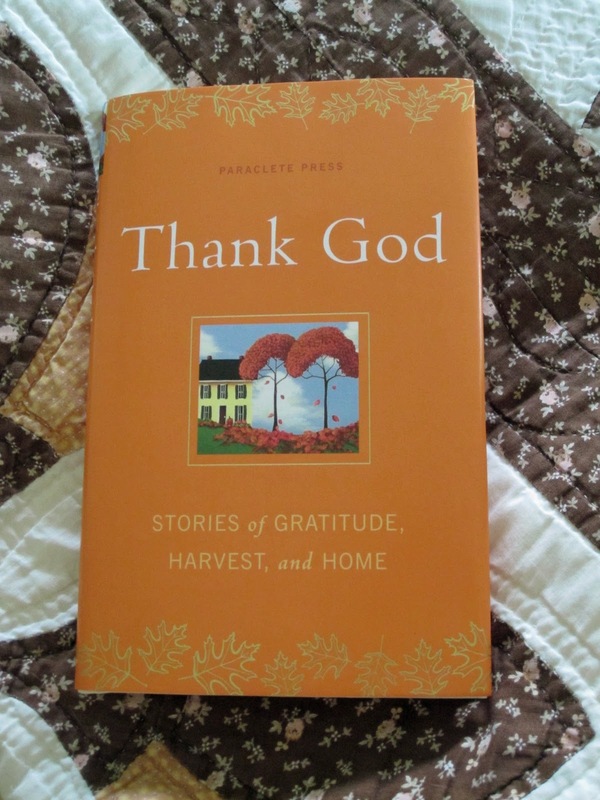 It includes a Thanksgiving short story by Louisa May Alcott. The best part though is the folk art on the front cover is mine. I'm honored to have my artwork on this sweet little book that is available at Amazon. Amazon also will let you have a look inside the book. So, stop by and take a peek. It is a quick read for a cool autumn day. How cool is that cover! I will stop by and take a look as it seems like a neat book for this season. Your painting looks wonderful and I can see how it kept you very busy. Congratulations, Cathie on having your folkart on the cover of the book! How exciting, and what a cute little book ~ I will go and check it out. Your painting of the Village Inn in Strasburg is wonderful. I know exactly where it is since we lived in Lancaster County. We used to visit the ice cream shop in Strasburg all the time! congratulations this is wonderful, I'll have to get this. Love the painting. And I think I will be purchasing the book. I think you should make a book of all your paintings with the stories. I know I would buy it. 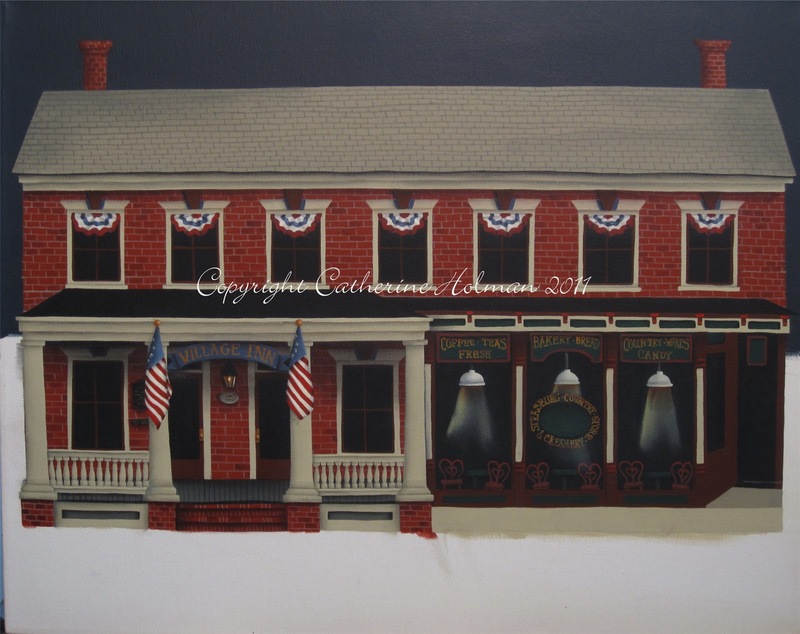 Cathie, I love the picture of the Strasburg Inn! I have gone past it and it looks just like that!! You are a wonderful painter. Have a great weekend! Congrats to you Catherine for getting your beautiful work published on the front cover of such a lovely book. I love your new painting, just beautiful. I understand too, some take longer to finish then others. I love your cupcakes but also love your architectural paintings. Have a creative week.